We in the UK are currently experiencing Obama-love. It is affecting all sort of people from Gordon Brown to the Queen. Really. Yesterday there was a photocall of The Queen and Prince Philip with the Obamas. Now, is it me or has the Queen shrunk? Michelle Obama looks positively amazonian in comparison. And what about the Prince Philip, I thought he was supposed to be tall? President Obama towers over the lot of them. And what a good looking couple they make? That's Michelle and Barack, not Liz and Phil. And then, shock horror, Michelle Obama did something that is firmly against Royal protocol. She put her arm around the Queen. Yes, she did! And not only did the Queen not freeze her out with a glare, or have her hauled off to the Tower , she reciprocated! Unbelievable! Never been known before in the history of everything royal. When the Australian Prime Minister put his arm around Liz a few years ago there was acres of news coverage about it, how inappropriate it was, etc, etc. It would seem the Obamas are a different class altogether. 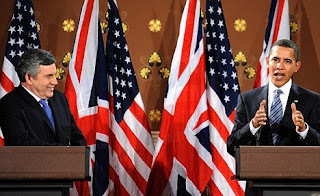 Next, there was news coverage of Gordon Brown and Obama talking to the press. Gordon Brown spent most of the time gazing adoringly at the superstar that is Obama, desperately hoping to catch some of his magic. And what's more, not only does Obama look like a president he sounds like one too. He managed to do something that George W. Bush could only dream of, he answered questions from the press and was really impressive. We rarely see coverage of the President speaking spontaneously or off the cuff, most of what we see is formal broadcasts but here we saw just how good he is. He must be the most charismatic and impressive President since JFK, surely? I love that back view of the Queen and Michele. I once attended an event where Prince Philip was guest of honour and I was struck with how small he was as I always thought he was tall too. It is so disappointing when you find out how minscule famous people actually are. Having said that the Queen really does look tiny. She is the real Mrs Pepperpot. 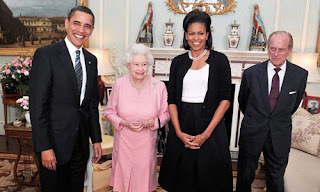 not so long a go touching the queen like that would have caused all manner of public outcry- now she bloody touches back - wow...........and Mrs Obama?- is she LOVING being first lady or what ?!!!!!! I'd pretty much stopped watching or listening to our former president. It was just too painful. Now? I could listen Obama read the phone book I swear. Oh come on, Liz and Phil are pretty adorable too, in that tiny-old-folks sort of way. Even Michelle couldn't resist a snuggle with the pint-sized queen! Oh I'm a real fan of Obama, mainly because he's a good looking chap! But he also talks sense too. I hadn't seen that photo of the Queen and Michelle arm in arm - amazing! Things are changing! Bless. Liz looks just like her mum! Isn't it fantastic that America finally has a president to be proud of? Love your blog and thanks for looking at mine! I think we all get smaller with age don't we?? Or at least shorter!! Didn't quite realise just how short the Queen had become though...funny picture! A comment about a comment: Love Audi's comment. I was also struck by how *tiny* the Queen looked in comparison to Mr and Mrs O! And, I distinctly remember when our PM behaved badly and put his arm around the queen...that Mr Paul Keating! Growing up my parents had a small plaque with a likeness of JFK on it hanging in the dining room. I never thought I'd feel that kind of admiration for anyone in our govn't...now everytime I see President Obama I feel happy and proud. Even my 2 year old smiles immediately when he sees him in a newspaper or on TV, altho the name is hard for him to master...it comes out "Bach O'mama" -- cute or what? I remember when Paul Keating (Australian Prime Minister who did put his arm around the Queen to guide her somewhere) did it, and it was bizarre the overreaction it caused. We all shrink as we age, my parents are much smaller then they used to be, I'm starting to tower over them! I am so proud of our President and our First Lady and it feels so good to feel proud again. p.s. Michelle Obama makes me feel short and I am 5 foot 9. I want to be taller and have arms like Michelle.I wish she would put out an arm fitness video. Do you think the Queen is smaller than Kylie? Theoretically (and only theoretically, because clearly it would breach Royal protocol) could she wear those gold lame hotpants? I can't believe the queen would let anyone touch her like this-- out of the protocol. The O'Bamas must be special indeed.